When is the Measure 101 vote? What does a “yes” vote do? What does a “no” vote do? How does Measure 101 protect health care for working Oregonians? How does Measure 101 lower health care costs for individuals and families? How does Measure 101 lower health care costs in general? What are the Measure 101 health care assessments? Have hospitals contributed more than 5.3 percent in the past? Are assessments like those in Measure 101 a common way for states to pay for health care? How does Measure 101 bring more money into Oregon for health care? How does Measure 101 create jobs and support Oregon’s economy? What happens if Measure 101 fails? What happens to federal money to Oregon if Measure 101 fails? What happens to Oregon’s economy if Measure 101 fails? Why is Measure 101 on the ballot? Where can I read the actual Measure 101 language? Why are the assessments in Measure 101 fair, when they don't include employers that are self-insured? Measure 101 asks voters to approve funding for health care for Oregonians. The measure supports health care for low-income children, adults, seniors, and people with disabilities on the Oregon Health Plan — our Medicaid program. The measure also lowers costs for individuals and families who buy their own health insurance. In total, the measure affects health care for more than one of every four Oregonians. The funds come from temporary assessments on health insurers and large hospitals. Voters will decide on Measure 101 in a special election on January 23, 2018. A “yes” vote protects health care for one million Oregonians on the Oregon Health Plan, and lowers the cost of health insurance by $300 per year on average for 210,000 Oregonians buying coverage on the individual market. A “yes” vote ensures Oregon maintains federal matching dollars for health care, potentially protecting nearly $5 billion in federal funds for Oregonians’ care. A “no” vote slashes funding for the Oregon Health Plan, jeopardizing access to health care for one out of every four Oregonians, including low-income children, adults, seniors, and people with disabilities without other viable coverage options. It also removes cost protections for 210,000 Oregonians buying individual health insurance. A “no” vote means a potential loss of nearly $5 billion in federal funds that pay for Oregonians’ health care. Measure 101 ensures that many working Oregonians who recently gained health insurance can keep it. 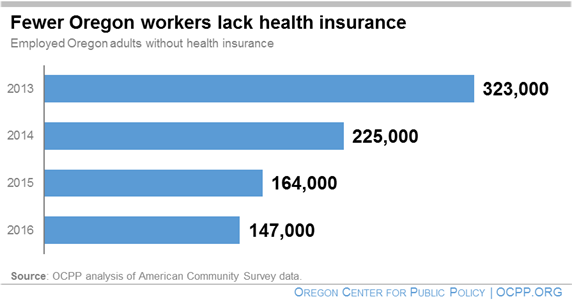 In 2013, over 320,000 Oregonians with a job lacked health insurance — more than one of every six workers. Since then, the number of uninsured working Oregonians has dropped by more than half, due to Oregon’s efforts to make health insurance available to everyone. Some have gained coverage through the Oregon Health Plan; others have purchased insurance through the Oregon Health Insurance Marketplace. Measure 101 protects those gains in health insurance coverage for working Oregonians. Measure 101 lowers the cost of private health insurance for 210,000 Oregonians who buy health insurance on their own. Some of the funds raised by Measure 101 leverage additional federal matching dollars to provide “reinsurance” protection for extraordinarily large health insurance claims. This allows insurers to lower health insurance premiums by about 6 percent, even accounting for the assessment the insurers pay. For Oregonians, that means savings of $300 per year, on average. Measure 101 indirectly helps lower health care costs in general. By helping keep hundreds of thousands insured, Measure 101 means more Oregonians are better able to get basic care and avoid expensive emergency care. They are also better able to pay their medical bills. When hospitals and other health providers are not left with patient bills that go unpaid they can charge less to everyone they serve. These cost efficiencies show up in lower health insurance costs for individuals and businesses. Measure 101 raises between $210 million and $320 million for health care from the Oregon health care industry by increasing an assessment on large hospitals and reinstating a type of assessment on health insurance companies that had expired. Specifically, the measure adds 0.7 percent to the existing 5.3 percent hospital assessment. The measure also establishes a 1.5 percent assessment on health insurers, managed care companies including coordinated care organizations, and the Public Employees Benefit Board. The previous health insurance company assessment, which helped pay for health care in Oregon, expired in 2014. Yes. As recently as March 2016, Oregon hospitals were contributing at a rate of 5.8 percent. The assessment on hospitals was lowered to 5.3 percent in April 2016. Are assessments in Measure 101 a common way for states to pay for health care? Yes. Forty-nine states use the same types of assessments to fund health care. Provider assessments are a federally-approved way for states to pay for their share of Medicaid. Measure 101 funding for the Oregon Health Plan allows Oregon to receive a much larger amount of federal dollars for health care. For every dollar the state invests, it gets three dollars on average from the federal government. For some groups covered, the federal match is as large as 16 to one. Measure 101 helps bring billions in federal dollars to Oregon, all of which goes to meeting Oregonians’ health care needs. Billions in state and federal health care dollars flow to every corner of Oregon, creating jobs in the health care field, and stimulating job growth in other industries as hospitals and clinics purchase local goods and services and as employees spend their earnings. Nearly all of the jobs created are in the private sector. If Measure 101 fails, it would blow a hole in the Oregon Health Plan budget between $210 million and 320 million in state funds, and potentially up to $5 billion in federal matching funds for health care if the newly-added Oregonians were to lose their coverage. Our state would face difficult choices. Oregonians relying on the Oregon Health Plan would be at risk for inadequate coverage or for losing it altogether. At greatest risk would be the 350,000 Oregonians who don’t get health insurance through work and were recently added to the Oregon Health Plan. Cost protections for middle-income Oregonians buying their own health insurance would go away, together with the federal funds that help lower their costs. 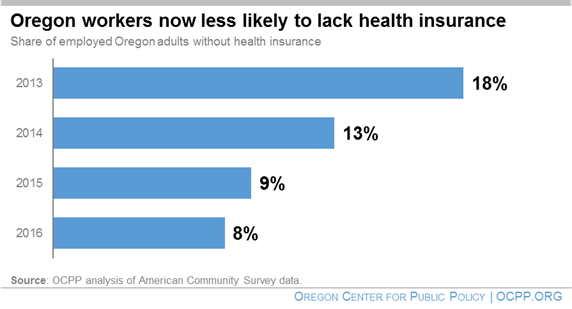 Recent gains in health insurance coverage for working Oregonians could erode. Alternatives to deeply cutting the Oregon Health Plan are cuts to education, services for vulnerable Oregonians, and public safety. If Measure 101 fails, Oregon risks losing as much as nearly $5 billion in federal dollars — about one third of all the money Oregon needs to provide health care for people relying on the Oregon Health Plan. If Measure 101 does not pass and the 350,000 Oregonians newly added to the Oregon Health Plan are dropped from coverage, Oregon would lose an estimated 37,000 jobs, nearly all in the private sector. Some jobs lost would be in health care; more would be lost in other industries. Rural communities would be hardest hit. In June 2017, state lawmakers enacted the law that has become Measure 101, in response to two urgent health care issues. The first stemmed from the decline in federal matching dollars for the 350,000 Oregonians recently added to the Oregon Health Plan. Initially, the federal government paid 100 percent of the cost for covering these folks who don’t get health insurance through work. Now, the feds are paying 94 percent. The challenge for Oregon was to pay its relatively small share. A second challenge was that private health insurance was becoming less affordable for individuals and families. In response, consumer groups and the health care industry, together with lawmakers from around the state, found consensus on a financing solution. A three-fifths supermajority of the legislature approved the solution. Opponents, however, have referred much of the law to the ballot. Measure 101 asks voters to approve the legislature’s broadly-supported solution. The ballot title and text of the measure can be found starting on page 15 of the Voters Pamphlet. The assessments in Measure 101 apply as broadly as federal law allows. For instance, the insurer assessment applies to multiple groups including commercial insurers, managed care companies, insurers serving Oregon Health Plan enrollees, and insurers serving many Oregon public employees. Self-insured plans of large employers were not included, because federal law appears to bar assessments from such plans. Yes. Under state law, all of the funds raised by Measure 101 go to a Health Systems Fund and a Hospital Quality Assurance Fund, both of which are separate and distinct from the state’s General Fund. By law, the money in the two designated funds can only be used to provide medical assistance to Oregonians, to lower health care costs through a reinsurance program, and to collect the assessments and refund overpaid assessments. Yes. Measure 101 protects funding for Oregon schools. Measure 101 provides hundreds of millions of dollars for health care in Oregon. Without Measure 101, the legislature could turn to the state General Fund for the funds needed to avoid cutting people’s health care. Education is the largest part of the General Fund budget and would be vulnerable to cuts if Measure 101 fails. It is noteworthy that groups representing teachers and school employees (Oregon Education Association and Oregon School Employees Association), parents and other advocates (Oregon PTA and Stand for Children), and school administrators (Oregon School Boards Association and the Confederation of Oregon School Administrators), all support Measure 101.